We wrote about the luxurious journey, using NEX and Keisei Skyliner to the city of Tokyo last time. Today is about economic options. How about getting a bottle of wine for dinner by saving transportation fee? In contrast with NEX and Keisei Skyliner, railways take longer to get to the city and there are no reserved seats. 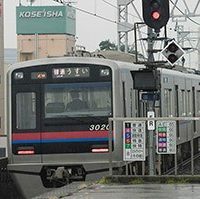 But you are probably able to grab a seat on the train if getting on the train from Narita International Airport Terminal 1 station, plus the train in Japan runs on time, as we pointed out. Taking account of long journey to the downtown Tokyo, seats seem to be more comfortable in Keisei Main Line cars, than the other railways. We believe that you will enjoy the view from the local line and have a relaxing time to Tokyo! 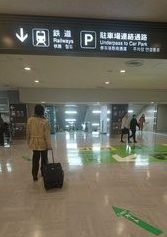 ①This is the view you will see right adter you come out from the arrival gate. 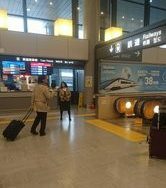 (the picture is North gate in 1F Arrival Lobby, Terminal 1) There are many facilities such as currency exchange, ATM, Bus and Rail Ticket Sales counters, Tourist Information Center on this floor. ②You will soon find an elevator going down to B1, Narita Airport Station. There will be a guide standing next to the elevator, so don’t hesitate to ask her even if you are lost! ③The station is almost there. There is a convinience store on your lefet hand side in the picture, where you can buy beer and snacks before you get on train. You may need to consider the effect of traffic jam but buses operate every 15 to 20 minutes in day-time. 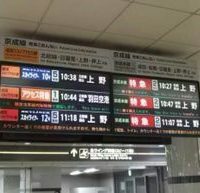 It will take about 90 minutes to Tokyo or Ginza station, if you are not involved in the traffic jam. (It doesn’t make much difference comparing to trains.) And fares are cheaper than railways furthermore! 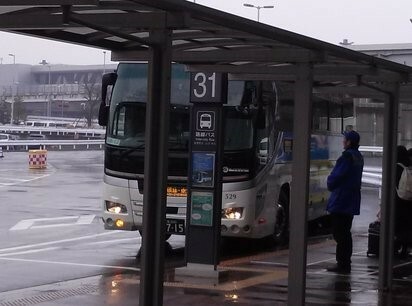 And of course, buses are easy means to get to hotels around the airport, bringing you directly to the entrance of hotels such as Hilton Narita, ANA Crowne Plaza Hotel and Narita Excel Hotel Tokyu. Toilet, free-wifi and power receptacle are provided in some cars. Please ask and check when you buy the ticket. 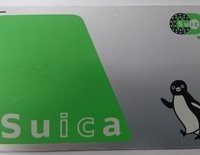 When getting on the Tokyo shuttle, you need to buy a ticket at the counter in advance. You get on either bus from the same bus stop. 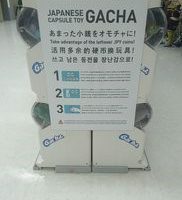 Signboard written in Japanese and English. Getting out at North-1 exit, in Terminal 1. How do you spend your free time at Narita Airport?